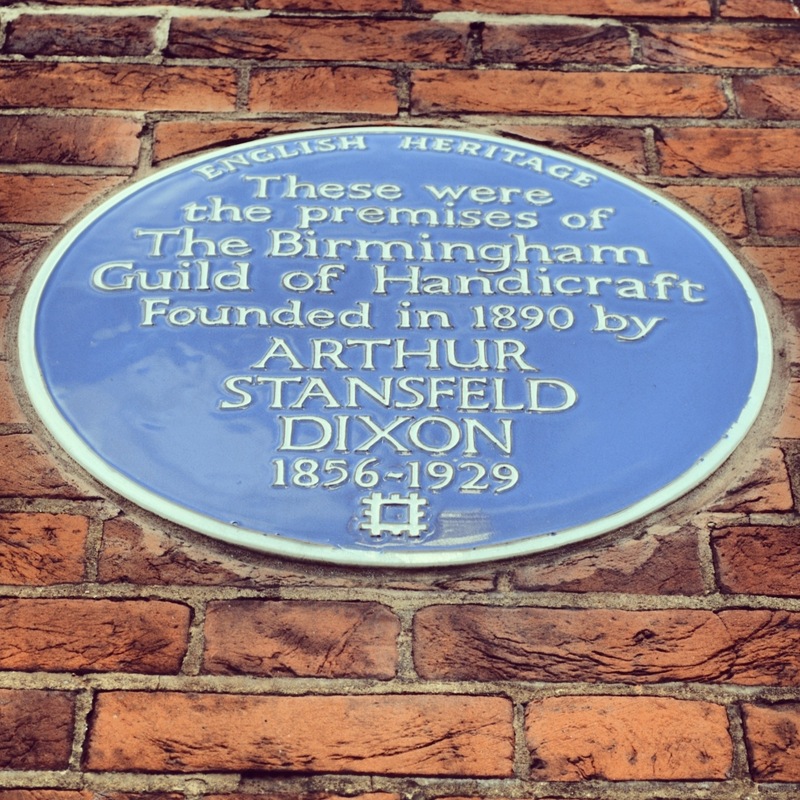 The Birmingham Guild of Handicraft was an Arts and Crafts organisation established in 1890 by local admirers of John Ruskin and William Morris. The Guild’s motto was ‘By Hammer and Hand’, and it produced high quality hand made pieces of metalware and furniture, and also pressed fine illustrated books and a periodical called The Quest, to which Morris contributed. 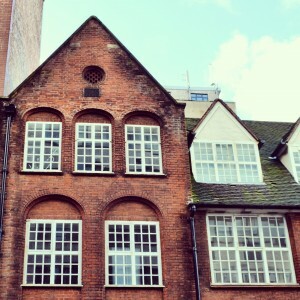 The Birmingham Guild had roots in social reform as part of the Kyrle Society, and grew out of classes for working men and boys, modelled on CR Asbee’s Guild of School of Handicraft in London. 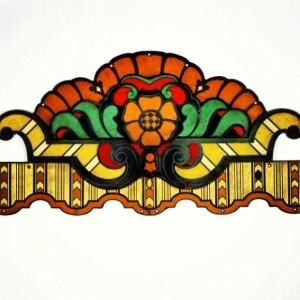 It was supported by the city’s nonconformist elite and took an interest in the welfare of its craftsmen. 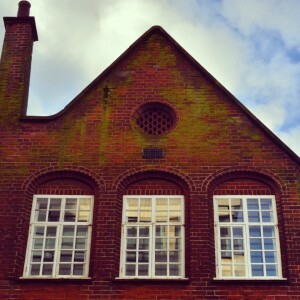 The Kyrle Society was founded in 1876 by Miranda and Octavia Hill – with that impressive mix of social conscience and slight condescension typical of Victorian reformers – to ‘Bring Beauty Home to the Poor’ through artistic decoration of hospitals, schools and working class clubs, and was a predecessor of the National Trust. 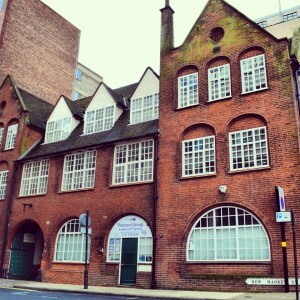 The Birmingham Guild originally had its workshops at the Society’s medieval building in Sheep Street, near Gosta Green. This building was replaced with the Kyrle Hall by Birmingham Arts and Crafts architect William Henry Bidlake in 1893. The building is long since demolished, along with Sheep Street itself, which disappeared under what is now Aston University at some point in the late 1960s. 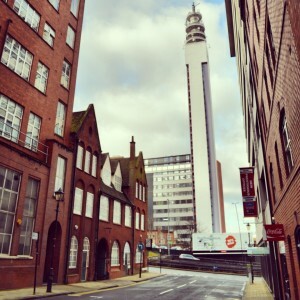 Despite its idealistic beginnings, the Guild also had a typically Brummie commercial edge. 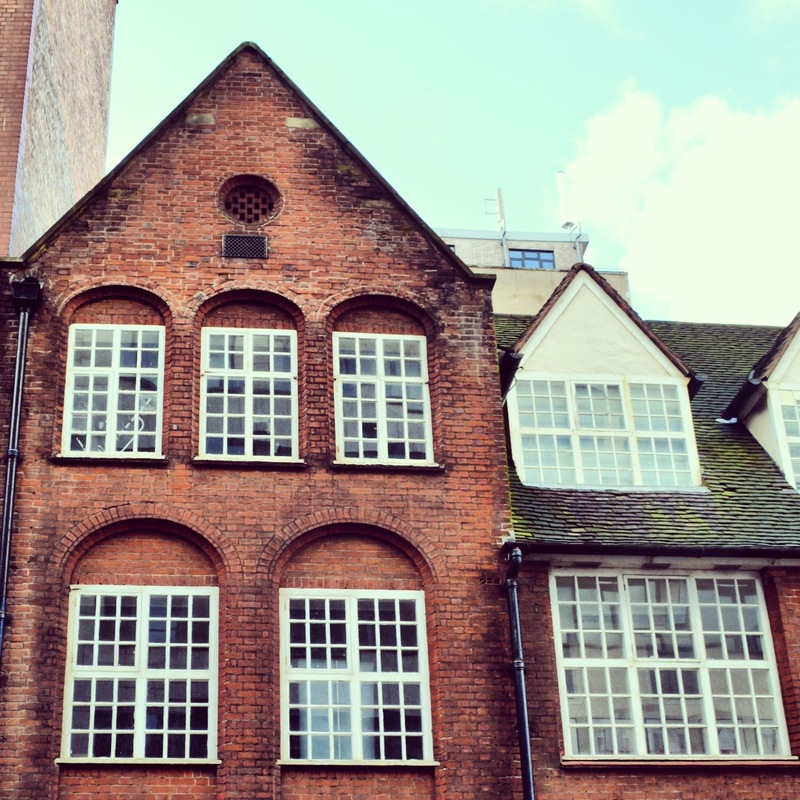 With the guidance of ER Taylor, first headmaster at the Birmingham School of Art, the Guild became an independent workshop and limited company in 1895, and moved to purpose-built headquarters at Great Charles Street in 1898. 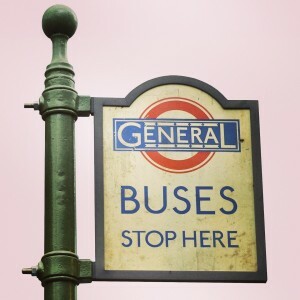 It produced all manner of goods – light fittings, door surrounds, tablewear; even the characteristic London Transport bus stops – and also ran a London showroom. The V&A holds quite a few pieces that can be seen online here. Commercial realities lead to mergers with E & R Gittins in 1905 and with Hart, Son & Pearl in 1919. The name was still shown until the 1950s in directories as “The Birmingham Guild Ltd., Architectural & Decorative Metalworkers”. 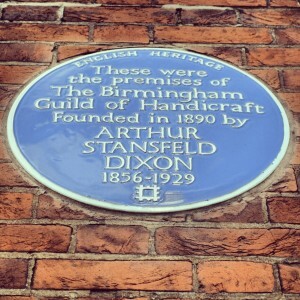 Arthur Stansfield Dixon (1856-1929) – the son of George Dixon, education reformer, MP for Birmingham, and Mayor in the 1860s – was the Birmingham Guild of Handicraft’s founder. 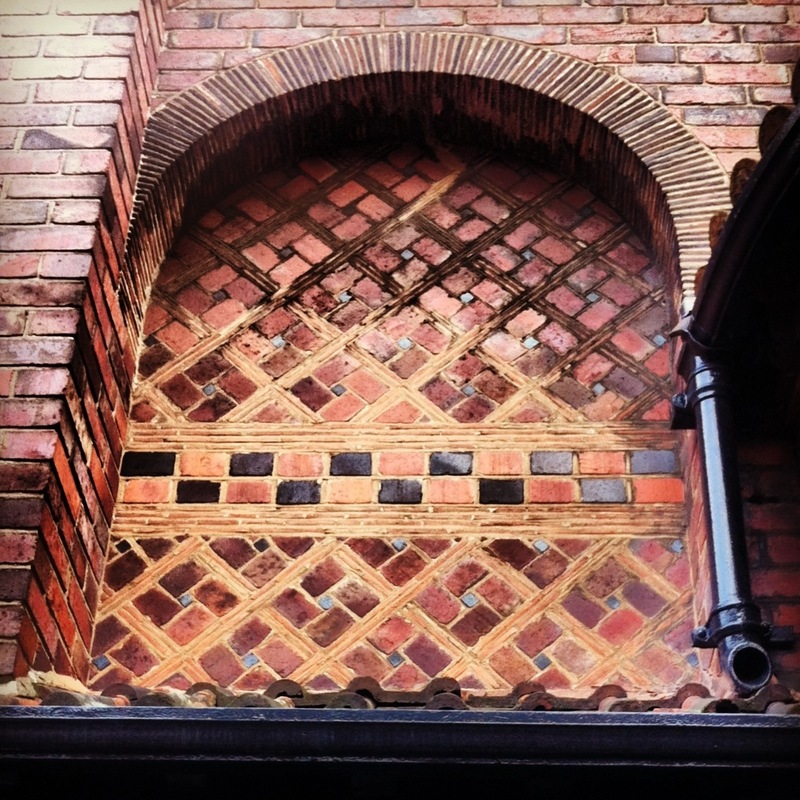 He was friends with Morris and Ashby, and also knew Phillip Webb, regarded as the ‘Father of Arts and Crafts Architecture’ and co-designer of Morris’s Red House at Bexleyheath. 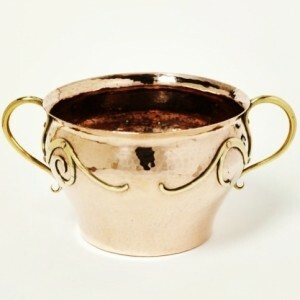 Dixon trained as an architect but was also an accomplished silversmith, copper worker and designer (something of a late-Victorian Wayne Hemmingway….). 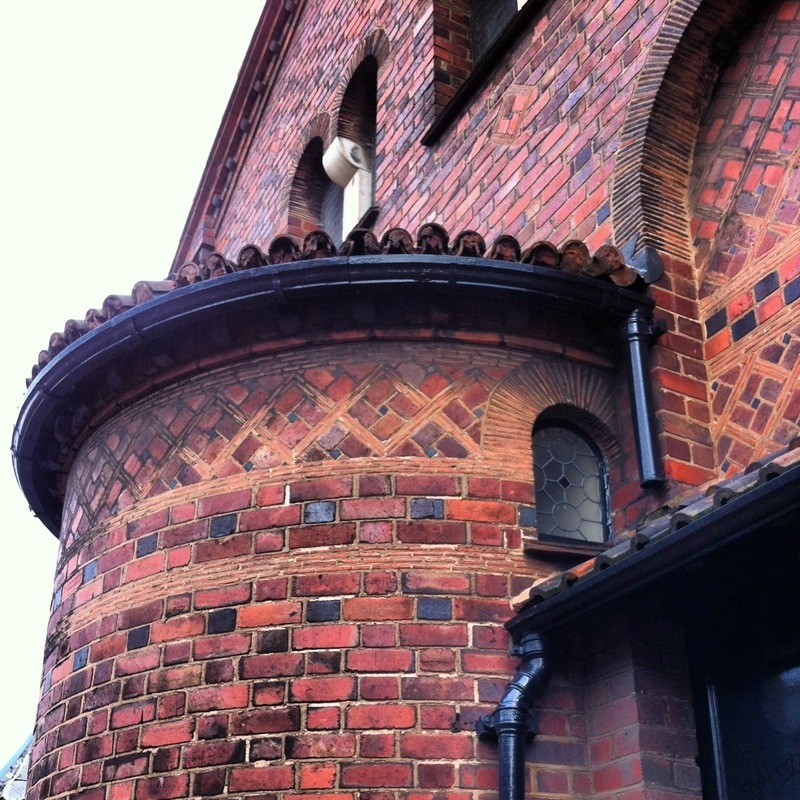 According to Pevsner, Dixon was the pioneer of Arts and Crafts Radicalism in Birmingham and “was an Anglo-Catholic Socialist who associated Gothic with establishment conservatism and dreary Anglican piety”. 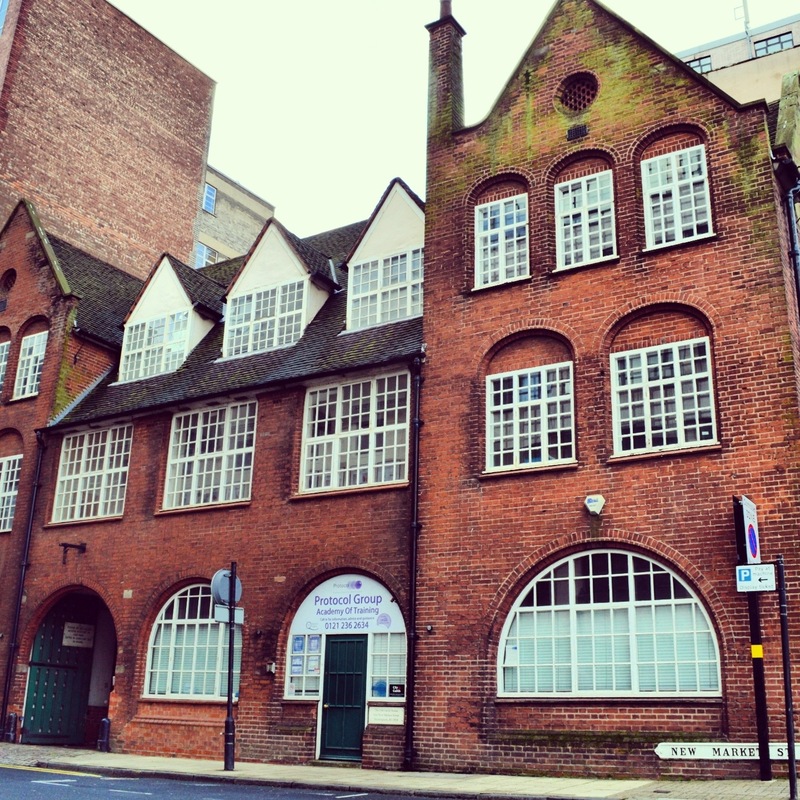 Dixon’s design philosophy is reflected in his design for the Guild of Handicraft building in Great Charles Street, which features round arched windows in a deliberate rejection of the Gothic Revival, a large roof contrasting with gables taken from older Midlands architectural vernacular, and bricks that are local seconds. The almost rural style and form of the building look particularly jarring today: it is dwarfed by newer buildings and the portal of the Queensway tunnel is just outside. (I suspect the utopian visionaries of the Arts and Crafts movement would be appalled by the encroachment of the modern era.) The building has now been converted to offices. AS Dixon is also known for his church designs – both interior and exterior – associated with Bishop Charles Gore, the first Bishop of Birmingham. 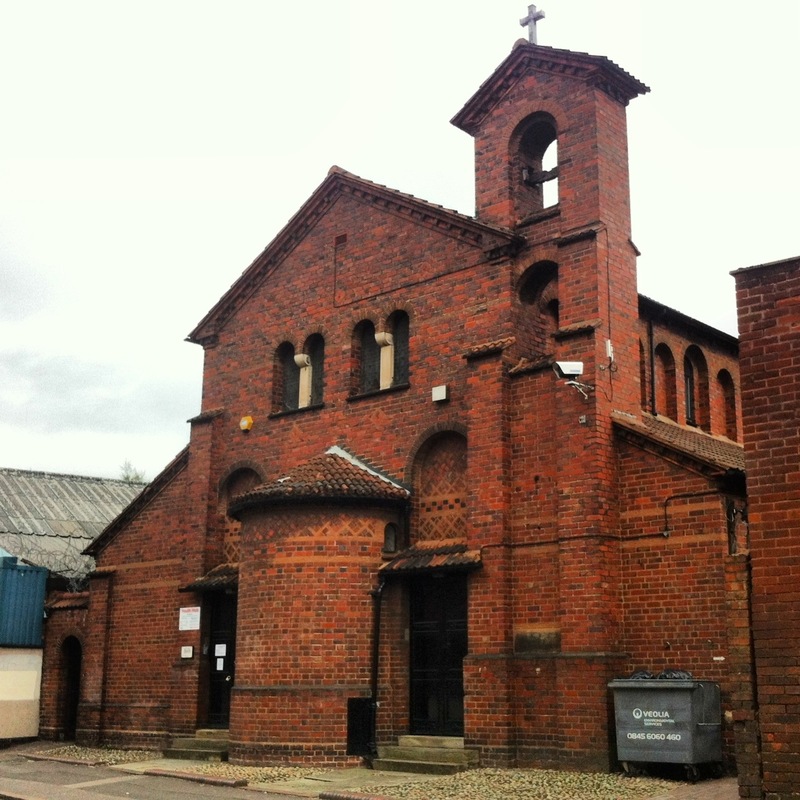 The Church of St John & St Basil (1910-11), just down the road from the Custard Factory, is “the finest example of his Arts and Crafts primitivism” (again, according to Pevsner). The building is in a Romanesque style and features intricate patterned brick work. It now sits well hidden amongst factories and workshops and is the centre of the youth homelessness work of the St Basil’s charity. Find out more or donate at www.stbasils.org.uk. St Basil’s has a Byzantine rural counterpart in St Andrew’s Church, just over the border into Worcestershire in Barnt Green. These two churches also have a big brother in South Korea, as in 1917 Dixon was apparently given the unlikely commission of designing the Anglican Cathedral in Seoul. Construction began in 1922 but only completed in 1996, after a British Museum worker found the original plans and returned them to the Church. Although the materials and size are very different, there are unmistakable similarities to St Basil’s and St Andrew’s in the cathedral’s form. Arthur Stansfield Dixon died in 1929, unfortunately outliving his son James, who served and died aged only 22 in the Royal Warwickshire Regiment in the First World War. A memorial tablet to James was placed in St George’s Church, Edgbaston by his father, and in 1920 he also designed the war memorial to the fallen of the Royal Warwickshires at St Philip’s Cathedral. I am Dr. BK Choi. Could I get a picture of Arthur Stansfeld Dixon? I’m a Anglican Church priest in Seoul Diocese. Anglican Seoul Cathedral was designed by A.S. Dixon, and built in 1926. It’s really beautiful romaneque style church building indeed! its on ebay.. ending tonight. Its on ebay ending tonight! My father, Greville Spencer worked for most of his life for The Birmingham Guild, and I visited “the works” in Grosvenor rd West as a child during World war 2. At that time they were making aeroplane parts for the De Havilland factory in Hatfield. Has anyone any insights as to the part played by Llewelyn Roberts in the firm or any other details. 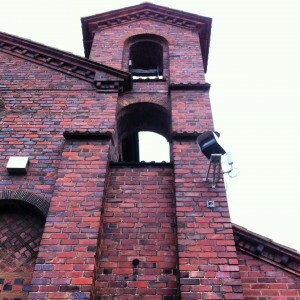 Hello Tim, I’ve been researching the Birmingham Guild for many years and have some information on Llewelyn Roberts. You can find my e-mail by searching for me on The University of Cumbria website. Hello Tim I’ve been researching the Birmingham Guild and have some information on Llewelyn Roberts. You can find my e-mail by searching for me on The University of Cumbria website. 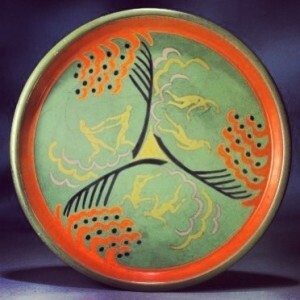 I read an excellent book on Ashbee some years back by Alan Crawford, I think a Dixon worked at Cadbury’s designing some of the chocolate dies, or it was someone who used to work for Ashbee at the Chipping Campden Guild. He lived on the Bournville trust on the brow of the main hill going the estate. You could pick his house out because it had a hand made hanging sign ‘Campden’ in the porch, sadly this disappeared a few years back.